Bit more bad luck for us last night as the Predators and Oilers both fell apart in the third period. The Edmonton game especially hurt as they led 2-0 in the third and we only needed them to go into OT to cash our ticket on the Oilers. We were right about Anaheim, which rallied from a 3-1 deficit to beat the Blues 4-3 in a shootout, and we pushed our Under 5 bet in the Bruins/Devils game. 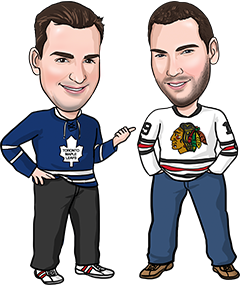 Tonight’s a Hockey Night in Canada special as our tips are on games involving Canada’s three eastern teams – the Senators, Leafs and Canadiens. Good luck tonight with your NHL bets. Senators have had this game circled on their calendar since their last meeting with the Bruins, which they not only lost 7-3 but also had a few brawls. Marchand got suspended for 3 games for his actions that night and returns just in time to visit Ottawa, and it won’t be a friendly atmosphere. Boston’s had some recent struggles in Ottawa (lost 4 of last 5 visits) and it won’t be any easier for the B’s tonight. Leafs are still playing well, even though they lost 2-1 last time out to the Kings. San Jose’s been awful at home and the panic button isn’t far away. The Sharks also don’t score many goals at home so if the Leafs can get a couple tonight (they’ve been averaging 3.5 goals a game lately) they should at least be able to get into OT tonight. Crosby loves visiting Montreal and he’s also been playing better since the Pens’ coaching change. Montreal hasn’t won 2 games in a row in nearly 2 months and they’ve won just once in regulation in their last 7 home games against Pittsburgh. The Penguins win tonight in a defensive battle.